84-Acre Tract Sold. The Village at Katy. HOUSTON – (Realty News Report) – A partnership led by Vincent Giammalva of Giammalva Properties of Houston has acquired 84 acres on Interstate 10 just west of the Grand Parkway, in one of the most significant land deals of 2018. Bill Byrd and Barkley Peschel of Colliers International represented the seller, Masaud Baaba, president of Omega III Investment Co. 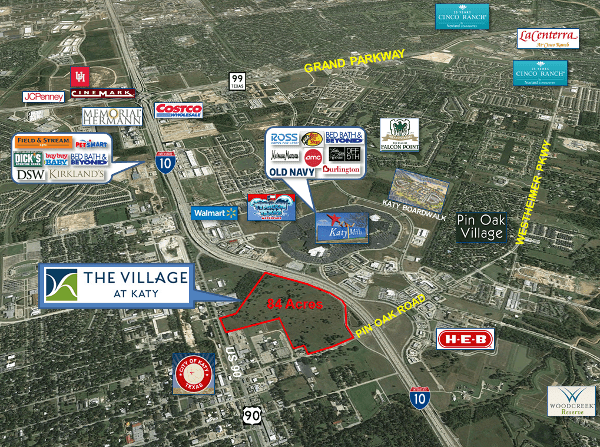 The site, marketed as The Village at Katy, is expected to be sold for various retail, restaurant and hotel projects. The property is on the north side of I-10, near the Katy Mills Mall and Pin Oak Road.